According to Jewish law, all Jews are obligated to give charity to the needy regardless of their financial situation. The Shulchan Aruch, the authoritative code of Jewish law, states that giving charity will never negatively affect one’s finances. Giving charity actually benefits the giver because G-d has compassion on those who have compassion on the poor. There is no shortage of worthy institutions and individuals to whom a Jew can give charity. Nonetheless, the Shulchan Aruch states that certain charitable causes take precedence over others, with one of the most important ones being marrying off poor brides, referred to in Jewish literature as hachnasat kallah. Jewish sources indicate that participating in the mitzvah of hachnasat kallah provides a person with many personal benefits. A well known mishna in Peah, recited daily in the morning prayers, lists hachnasat kallah among a select few commandments that benefit a person both in this world and the next world. 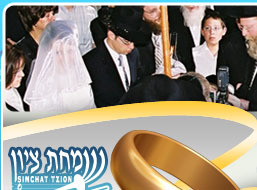 The mishna itself does not describe the benefits; however other Jewish sources indicate that hachnasat kallah assists one in finding a spouse, being blessed with children and being saved from a life threatening illness. The tractate of Sotah states that there is a fundamental rule that G-d treats a person in the same way as he treats others. For instance, the mishna says that in the merit of Miriam waiting for her infant brother Moses who was placed in a basket in the Nile River, the entire Jewish nation waited for her when she had tzaraas (a skin disease). It would likewise make sense that in the merit of helping someone else marry, Heaven will help one find his or her spouse. It appears that hachnasat kallah can also be a merit for having children. The Tractate of Shabbos states that one of the questions asked of a person after death is whether he was involved in the mitzvah of pru u’revu, the commandment to have children. The commentary of Maharsha asks how Heaven can hold a person responsible for something not in his control. He answers that one is not asked whether he fulfilled the mitzvah of pru u’revu, but whether he was involved in the mitzvah. He adds that assisting orphans to get married, which will lead them to having children, is considered involvement in the mitzvah of pru u’revu. The Steipler asked why the mishna enumerates the three precepts in that order. He explained that this order was chosen to teach that hachnasat kallah can intervene and protect the ill from death. He explained the mishna in the following manner: If one is so sick that people are coming to visit him, he should forestall death and being accompanied to his grave by providing for a bride. The Steipler believed that the mitzvah of providing for brides was placed between visiting the sick and accompanying the dead to teach us that hachnasat kallah can serve as a barricade between sickness and death. Over twenty years ago, the chief rabbi of Belgium, HaRav Chaim Kreisworth zt”l was very ill. He visited the Steipler to receive his blessings and advice. The Steipler advised him to undertake marrying off needy brides. Rav Chaim immediately began to do so and miraculously recovered, living to the age of eighty-two. 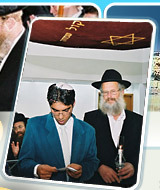 Simchat Tzion offers you the opportunity to fulfill the unique mitzvah of hachnasat kallah. 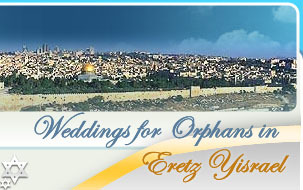 We invite you to look at the Upcoming Wedding page of this website to find an orphan for whom you are willing to sponsor a wedding in whole or part.